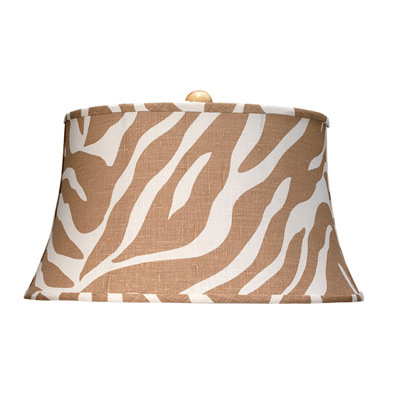 This Zebra print shade is constructed to fit a lamp base either made by Jamie Young or another lamp base. The medium shade is shown here with the Jamie Young Low Country Lee Urn Table Lamp. Medium: 14″ wide top x 18″ wide bottom x 10″”h Large 17″ Large: wide top x 21.5″ wide bottom x 13″ h”. Not only do we adore the Jamie Young Company for their fine hand craftsmanship, use of quality materials and downright strong design, we also admire their environmental consciousness. They are increasingly utilizing renewable resources like bamboo and mango wood, recycled boxes and packaging materials which make us that much more head-over-heels for this brand!